With only 12 guests, Prima offers a more personalised sailing experience with greater flexibility. Join in with the sailing to enhance the adventure or just relax on deck. Experience an unforgettable 2 day 2 night sailing adventure. 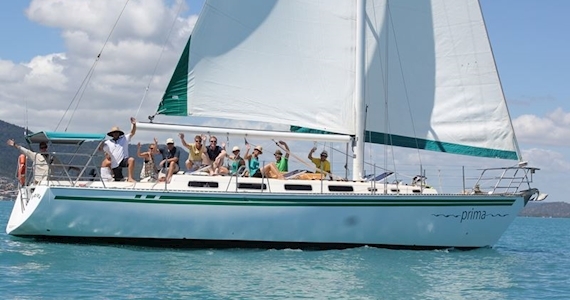 With only 12 guests, Prima offers a more personalised sailing experience with greater flexibility. Join in with the sailing to enhance the adventure or just relax on deck. You can get in, get wet, swim and snorkel or just feel the sand between your toes! The Prima itinerary is another drawcard for travellers who are wanting to experience genuine sailing and enjoy some snorkelling, sunbaking and exploring on the Whitsunday islands – and of course Whitehaven Beach is on the itinerary. Prima offers three private double cabins with ensuites, a shared double and two single bunks meaning this trip is great for couples as well as solo travellers. Prima is a 47ft Woodward designed charter yacht, superb for chartering the calm waters of the beautiful Whitsunday Islands. Shared Saloom Accommodation – There are beds in shared/open plan salon area, for up to 4 people to share and sharing bathroom with other guests. Private Double Cabin – There are two private double cabind with curtain, 2 people to share each cabin and sharing bathroom with other guests. When you arent beaching it, take advantage of the pristine aquatic environment, with all snorkel equipment provided, take the splash and get up close and personal with the exciting marine life while you snorkel. If its your first time, let the crew know and they would be happy to assist you in this unforgettable experience!